Here, I depicted Dimorphodon with speculative, low keratinous crest which extends from the top of the skull along its length, and dewlap with scaly integument. 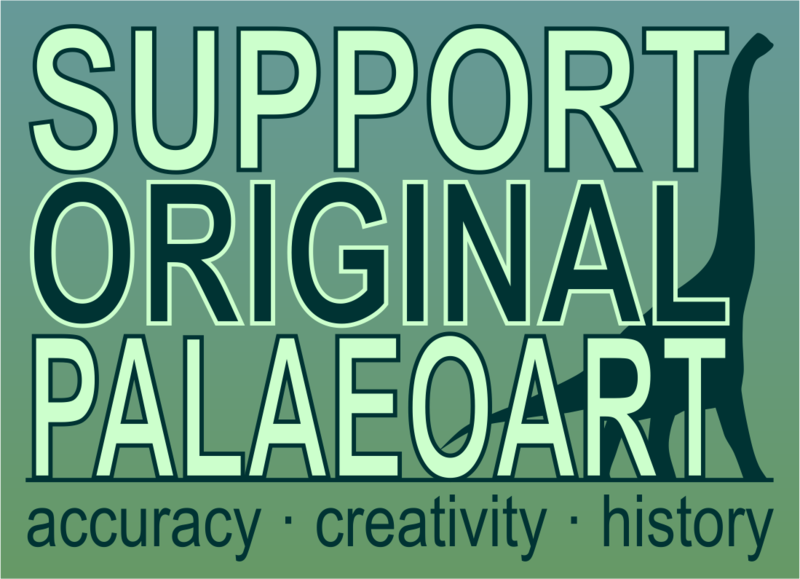 Since the point of the contest is not only to depict speculative behavior or anatomical features, but to create artistically unusual paleoart. Therefore I went with more impressionistic approach than my usual style, adding just a pinch of surrealism with the clouds resembling azhdarchid pterosaur. This silhouette is hinting at the future of Pterosauria, when true giants will rule the skies." 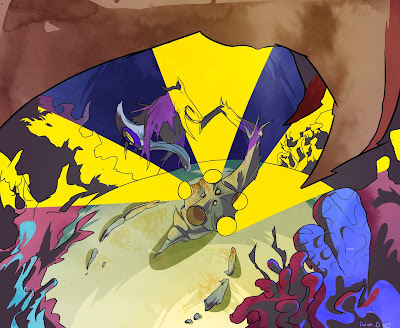 "Here's my entry for the All Yesterdays contest; a sand-submerged Opabinia, luring in prey with flashes of light emitted from the five structures previously thought to be eyes, before snatching it up with its plant-disguised trunk. It appears as if a larger predatory anomalocaridid is approaching, but no fear. The Opabinia may simply shut off its bioluminescence and bury itself entirely in the sand." "Though not visionary in style or concept, I thought that the multiple panels typically seen in comics or graphic novels are a great way to express motion. 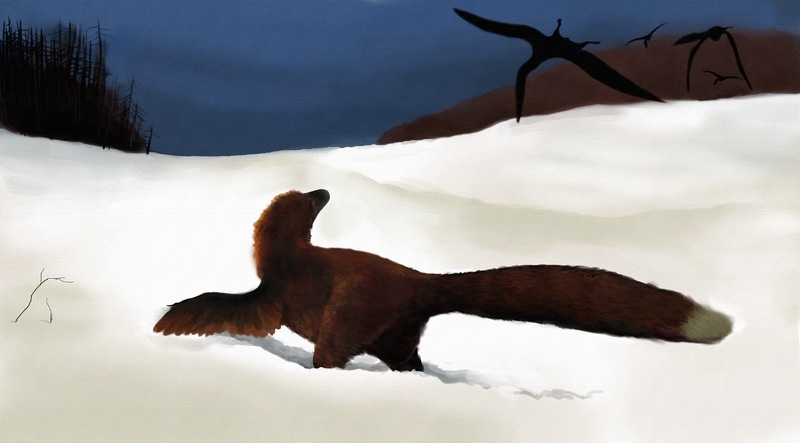 My idea is that a small dromaeosaur might hunt in snow in a similar way to modern foxes or owls: it might not be a strong flyer, but it could generate sufficient lift to pounce on unsuspecting mammals. Hopefully, the action in the foreground distracts from the crappy trees in the background." "The inspiration stylistically is Winslow Homer-- hell, it's more or less a straight-up pinch of "The Fox Hunt" by Homer, only digital. Behavior-wise, there's nothing too off-the-wall, though I've always wanted to explore the idea of dinosaurs in the snow to its logical extreme. 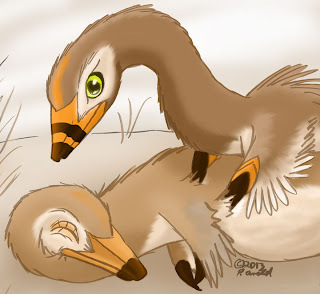 The animals depicted are a non-specific deinonychosaur (probably Dromaeosaurus) and the pterosaur Piksi barbarulna, both from the Two Medicine formation of late Cretaceous Montana." "I have depicted a Cryolophosaurus with a bioluminescent organ pouch attached to his head. I imagine the pouch is inflatable (in the picture it is shown fully inflated),with filaments inside that produce the luminescence. I imagine this organ would be used during the long, dark days of the antarctic winter to impress a potential mate,and also as a means of visual communication from long distances. 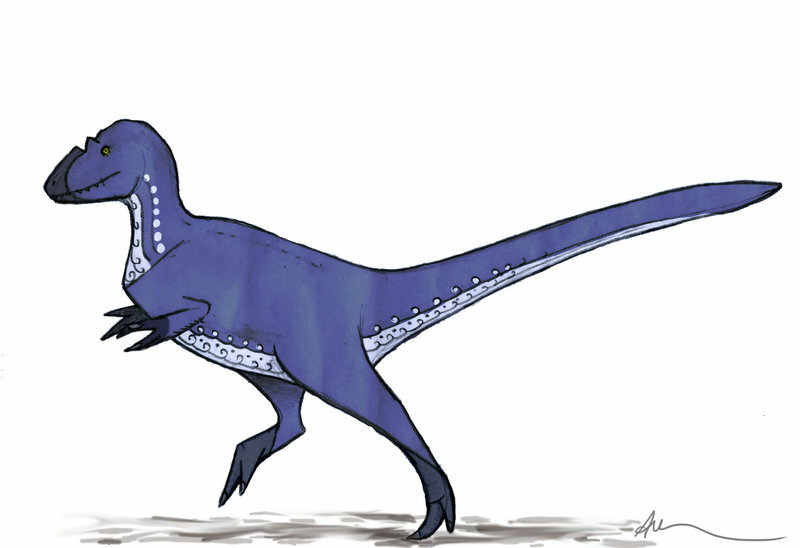 I realize that this would make Cryolophosaurus the only landborne vertebrate with bioluminescence, but heck,if any animal deserves bioluminescence, it's the "ice creasted lizard". My artistic inspiration for this picture came from comic book artists Mike Mignola and Frank Miller. I love the way these two artists use stark lighting,creating shapes with careful placement of black and white." "Here a stylized fully feathered Citiapti, aka "Lord of the Dead." Radical coloring, in this case cursorily based on the two types of peafowl, provides that these male "giants" of the Djadokhta were pretty durned flashy, highly visible, and very colorful. 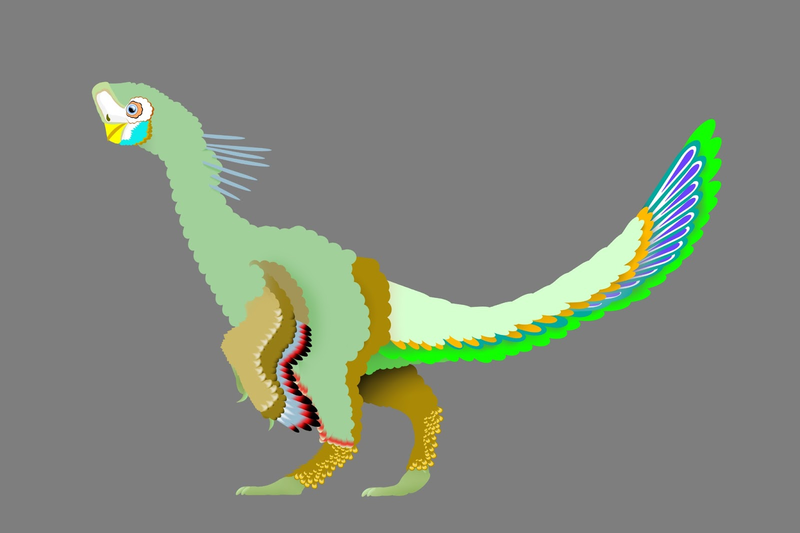 Facial feathers alternate with white and pink facial skin around the beak, only serving to offset the sienna base coloring. Pheasant-like color patterns around the feet make for interesting possibilities toward dance displays. This is contracted with a stately, princely posture. He doesn't NEED to dance to know ... he looks GOOD." 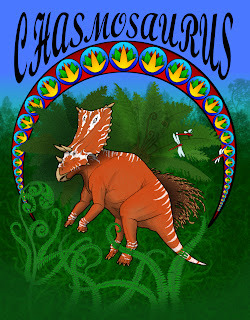 "Kaprosuchus, known only from it's really cool skull, is a treasure trove of possibilites. 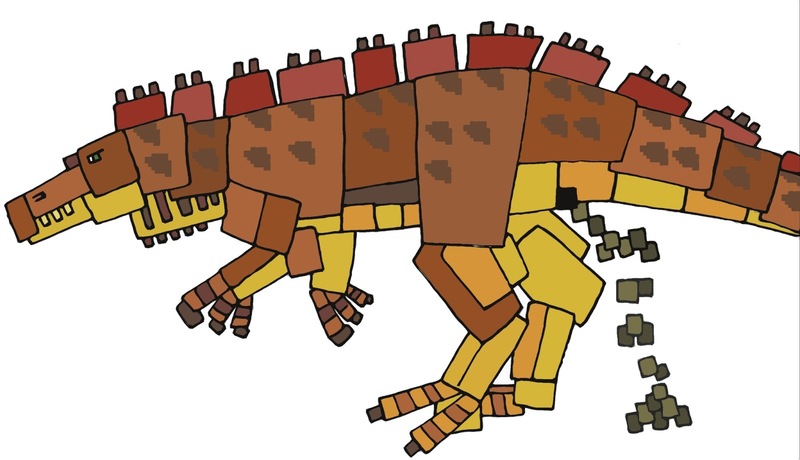 Here I have it modelled as a super scavenger, an armoured brute that bullies other predators off their kills.With its mean bite and armour, modeled on Aetosaurs and Simosuchus, Kaprosuchus would have been able to push predators much larger than itself off their kills. 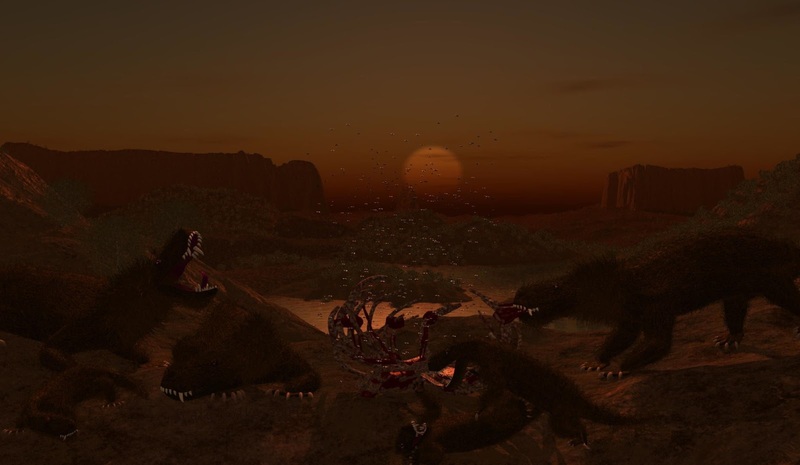 In the background are two generic dromeosaurs that were bothering Kaprosuchus too much as it was trying to eat their kill, so the Kaprosuchus got a bite in on a tail. Kaprosuchus is not something you want to get bitten by." 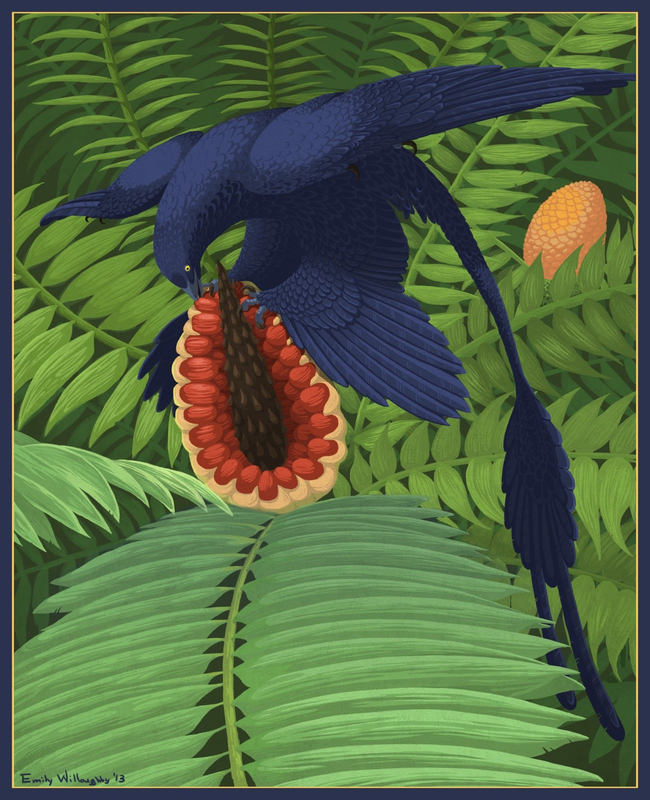 "In stark contrast to the unusual illustrations of the animal fearlessly scarfing down a bird or a mammal, here Microraptor is munching on a cycad fruit. While speculative, it is something that I genuinely believe is the case (that Microraptor was an omnivore), and I think it's perfectly possible that one of the ~300 undescribed specimens of this animal may preserve plant matter gut contents. Hard to say. In any case, I think that Microraptor has certain features that are consistent with omnivory in maniraptorans, including having somewhat unusual dentition by dromaeosaur standards. For stylistic experimentation, I tried a sort of cell-shaded, pseudo-vector type of look." I always thought early ceratopsid skulls had a certain superficial resemblance to those of rodents. I decided to do a young psittacosaurs stuffing its pocket-like cheeks with cycad fruits like some modern rodents do. "I've always been fond of the extremely stripped down style of animated works, and after watching Secret of the Kells, I wanted to apply that abstracted sensibility to dinosaurs. Here we see a Yutyrannus bounding cheerfully along, with graphic design flourishes providing texture and a coloration that rarely gets applied to big predators." 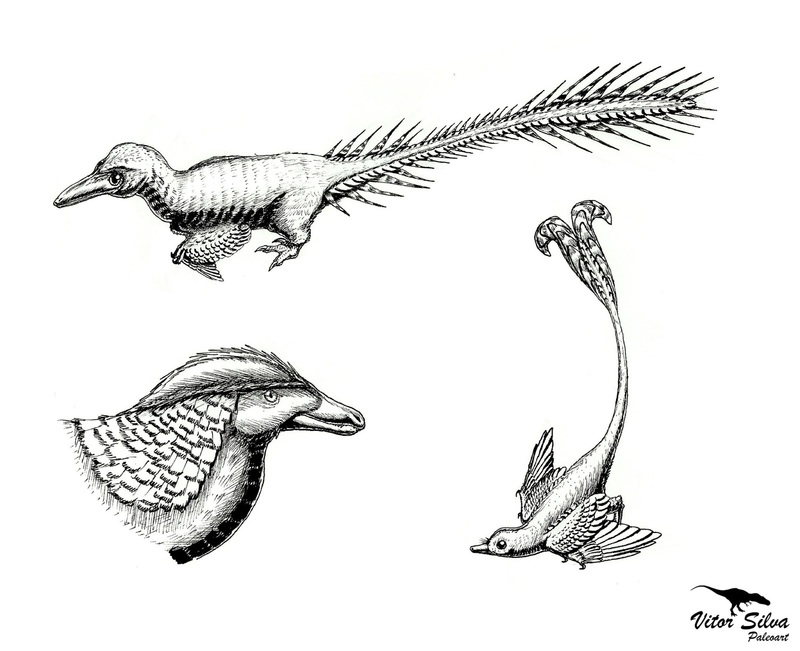 "Here, some deinonychosaurs (Saurornithoides, Linheraptor and Rahonavis) are depicted with very weird feathering, opposing the traditional and conservative way that feathered dinosaurs are restored when the feathers aren't preserved. 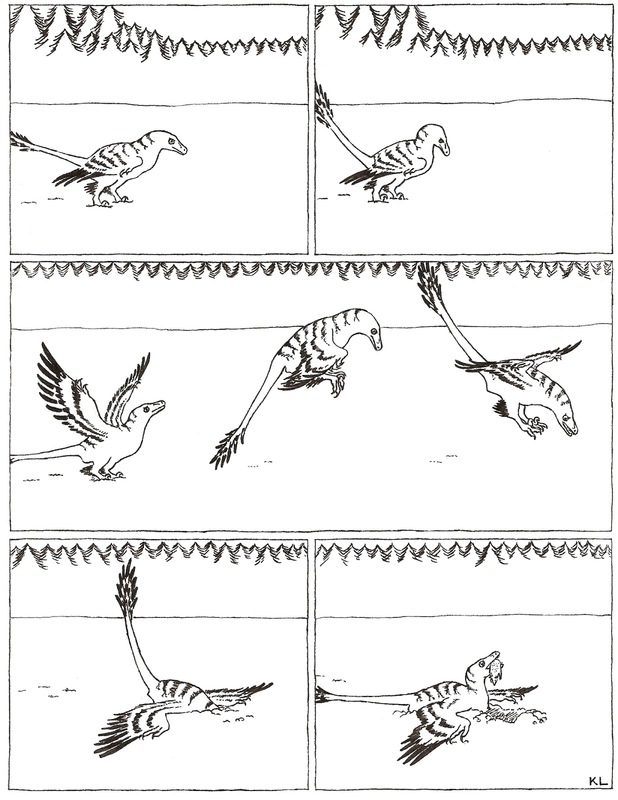 And despite calling these feathering weird, they're all based in modern birds (grouses and pheasant). The art style is based in comics inking, with China ink." 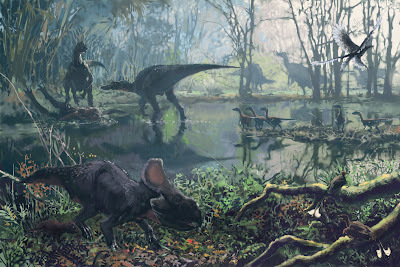 "A Cretaceous Euro-Asiatic piece, where a spinosaurid has chased an iguanodont. Raptors are watching, a Microraptor is flying, a Protoceratops is trying to get away and two Confuciosornis are on the roots of a tree." 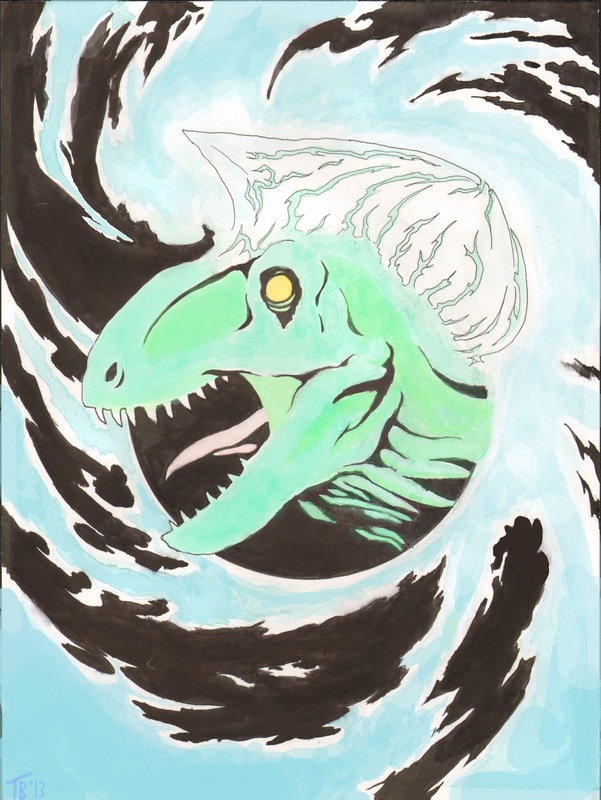 "Deinonychus Antirrhopus, done in prismacolor, graphite, and ink. 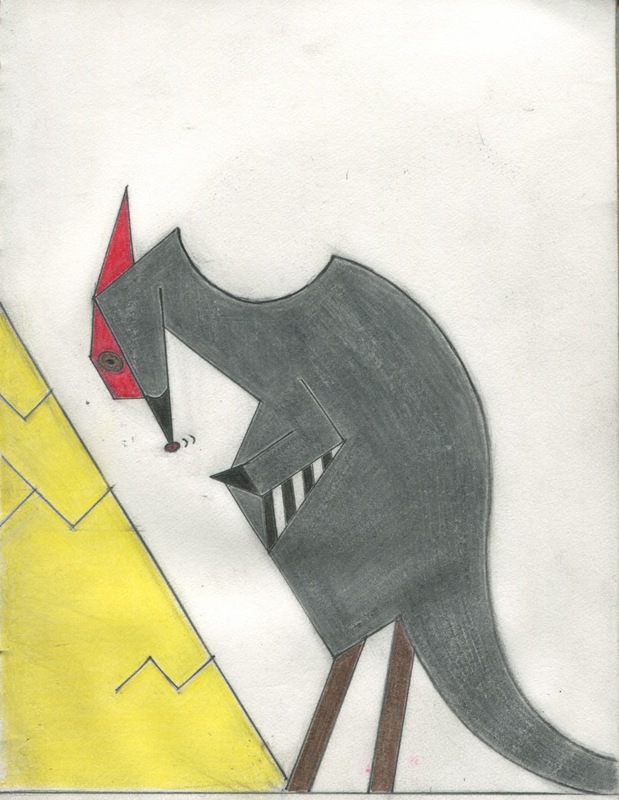 12"x18"
"Suchomimus Defecating, inspired by Cubism and Polygons." 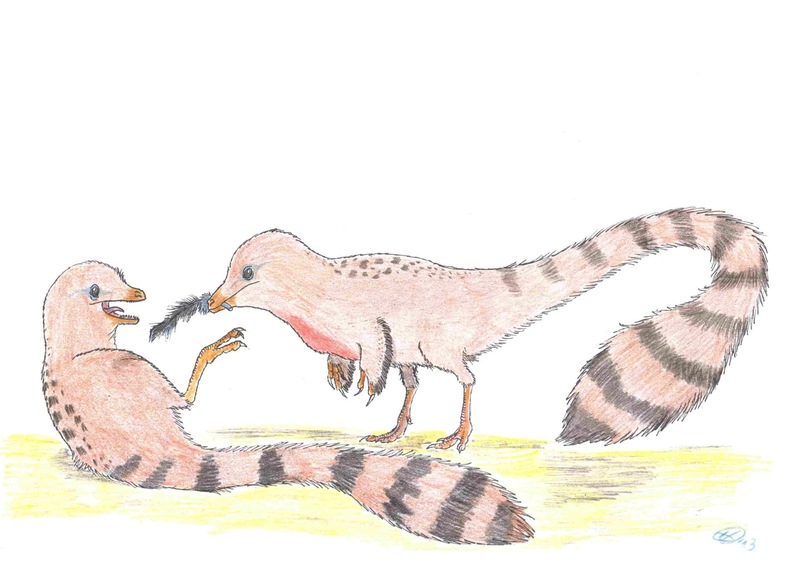 "Here is a pair of Compsognathus longipes playing with what remains of an Archeopteryx feather. Some birds like corvids and hawks engage in play behavior also using objects they find (feathers, leaves and such), maybe Mesozoic dinosaurs did the same, who knows? I gave 'em a bushy tail because, after the discovery of Sciurumimus (which I guess was a compsognathid of sort more than a megalosaurid) I think we can play it safe saying that some small dinosaurs could have been fluffier than usually thought... Hence the tail and the robin-like appearance." "To best enhance their spectacularly colorful courtship display, Dimetrodon gather in the intense early morning and late afternoon sunlight on hot summer days with the clearest of skies. Pencil, watercolor, and ink on 9" x 12" paper." "This shows Pentaceratops with integument homologous with those found in Psittacosaurus. In my picture, the integument has evolved to be more feather-like, meaning branched and quite colorful. Most of the time, the integument is laid flat on the back (see adult specimen on the left side), but if there is a threat (e.g. a predator, or a rival Pentaceratops), the animal menacingly spreads out its integument. From the front, this makes the frill appear far broader than it actually is (see specimen within the escutcheon). It also gives somewhat the illusion that the integument grows directly out of (or at least just behind) the frill. But when viewed from the side, it's easy to see that they are actually dispersed over the whole backside. 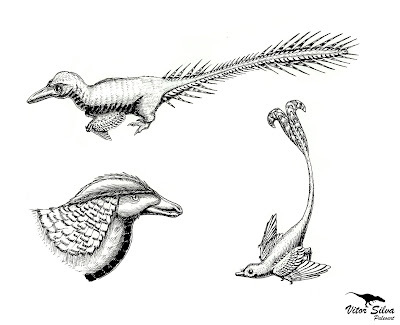 (See specimen on the right side) Also, the integument and scales of the calves are far less flamboyant, in order to draw not too much attention from predators. 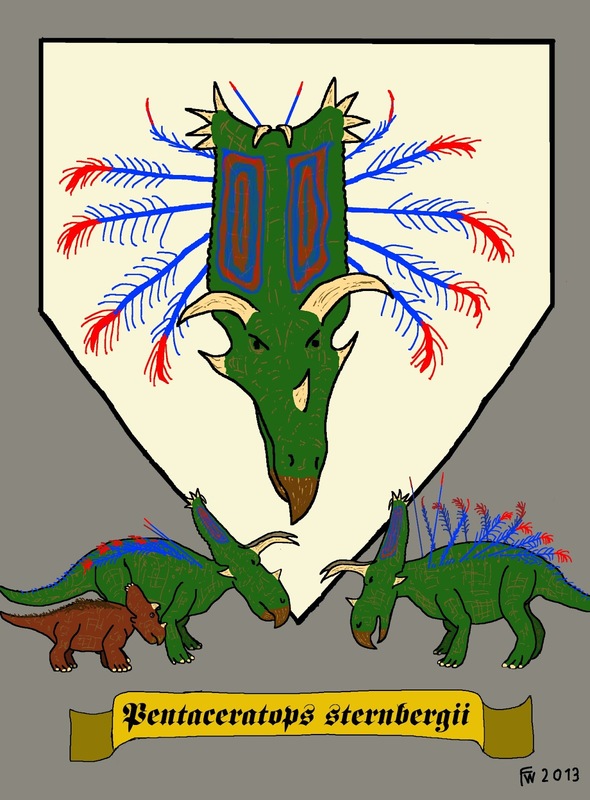 I chose my picture to look like a piece of heraldry with three of the Pentaceratops as the supporters and the head of one in the escutcheon, because I think such a front view of ceratopian head would make a quite fabulous coat of arms! 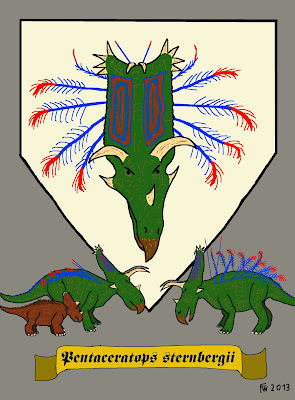 Dinosaur heraldy may not be a 100 % novel idea (there is the Iguanodon as part of coat of arms of Maidstone, and of course some of the works of Mr. Orr as seen on your webpage), but it's nevertheless a field that's still quite unexplored and fallow!" "Gorgonopsids of the Permian, South African Karoo Formation." "Of the 2 forms of anting, I figured the former was more likely, given the facts that 1) alvazersaurids had long necks & short arms, & 2) alvazersaurids were probably seeking out ants for food, anyway. 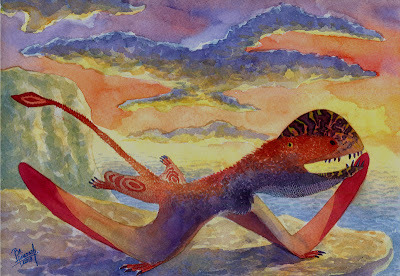 The alvazersaurid is generic, based loosely on Linhenykus, which lived in the Gobi region during the late Cretaceous. The color scheme of the alvazersaurid is based loosely on a combination of the Northern Flicker (an insect-eater like Linhenykus) & the Scaled Quail (a ground-runner like Linhenykus), both of which live in the Nebraska Sand Hills & are known to ant." 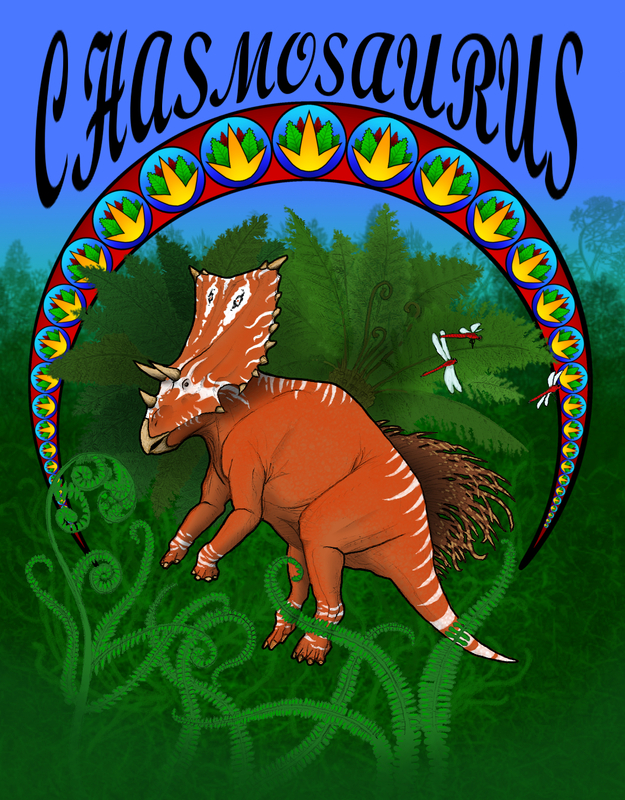 "I've drawn a Chasmosaurus (seemed appropriate) in an Art Nouveau kind of style. I've depicted the animal with quills on his back like psittacosaurus had, maybe serving a display function or even defense." Huge thanks to everybody who entered the contest! We're seriously thrilled by the amount of talent and imagination on display. Which are your favorites? What do you wish you had seen? Sound off below! Really awesome art work, wow. This is definitely going in my bookmarks. From the looks of it, Julio Lacerda's is in the top three. Good. I doubt you'd miss out on showing that if it hadn't won amongst all these here. We didn't get a submission from Julio, unfortunately. I was really hoping he'd enter ours, but it looks like he went with the official contest. You had one job, Cody! Ah well. When I finish it, I'll post it somewhere on the internets just for you. Have to say I'm very happy with the quality of work that has gone into this competition though. Great work everbody. The Opabinia had me confused what the hell is going on in the pic, but I guess that is to be expected with Cambrian Explosion fauna. That Dimetrodon display is a beautiful idea. 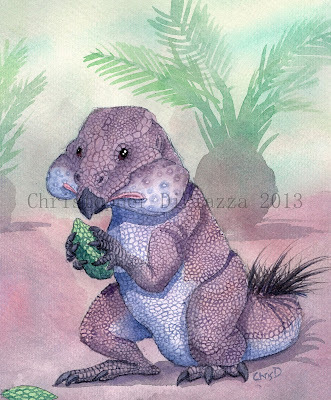 The Psittacosaurus is the definition of ugly-cute. Anything specific about it that you find confusing? I don't mind elaborating. Sharon's drawing is absolutely beautiful. Agreed. I think that one is one of my favorites. And one of mine too. 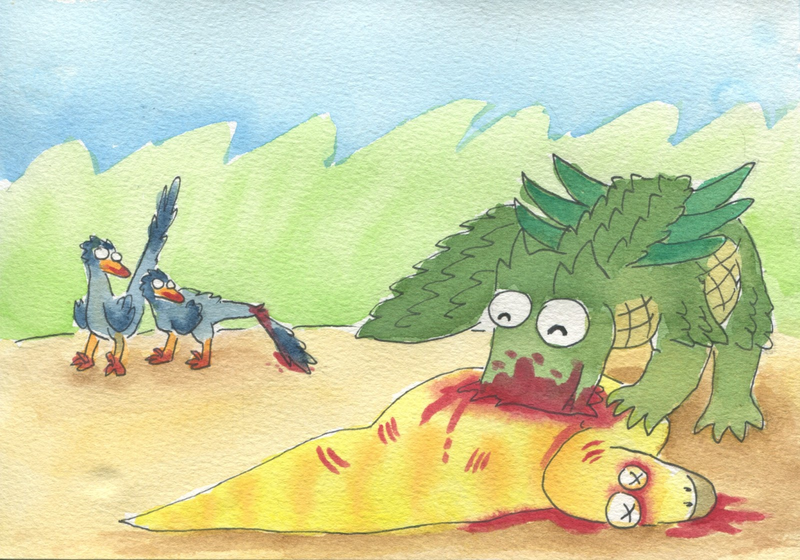 While I didn't think I'd win, I'm surprised Emily's Microraptor didn't make the Top 3, especially given the style. BTW, I also really like Loughney/Heaston's foxy dromaeosaurs & Trish's "Allopreening Alverezosaurs!". Huh. Looks like I'm the only one who did an invertebrate. Curious. Regardless, there is some absolutely gorgeous work here. I'm quite excited to see the winning entries. I did do an invertebrate one - it just didn't make the runner-ups that's all. Maybe there were other invertebrate entries too. Adam, I really love your piece! The colors, the figure-ground play, composition, everything. 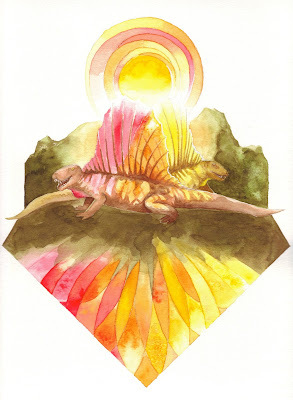 ~ Herman Diaz's anting Alvarezsaurid. Has a rather Bauhaus/De Stijl look, I thought. 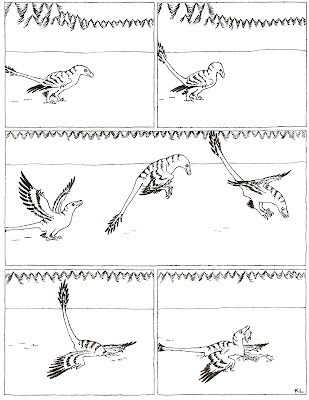 ~ Ross Martin's Deinonychus. Though it has a dislocated leg, the Oriental feel of the piece couldn't escape my notice, in particular those phoenix-like tail coverts. ~ Mitchell Seymour's sauropod-mimic ankylosaur. The most charming of his submissions (again, I agree with Asher on this). ~ Leonardo Romero's 'Cretaceous' scene. Difficult one to judge under our criteria, but I was arrested by its atmosphere. Many thanks for the kind words. :) It's good to know my piece got noticed amongst all the others. Lots of beautiful stuff here. I love Vladimir's, Paul's and Sharon's especially. Leonardo's is stylistically breathtaking, though I'm not sure I'm catching what's "all yesterdays" about it. We made a judgement call on that one--since a large part of the contest is about using different artistic styles, we felt that it got by pretty much on that. And, as you mentioned, it's absolutely gorgeous. Great stuff! 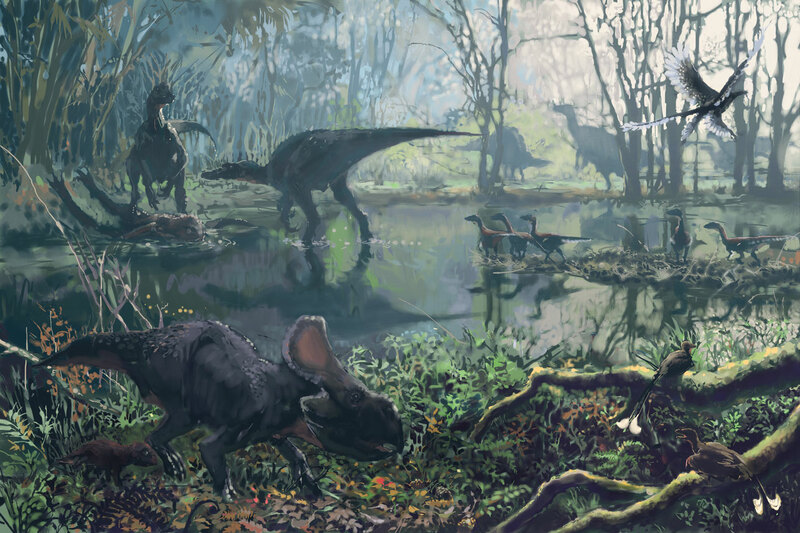 Laughed out loud at the cheeky ceratopsian (great expression) and the pooping cubosaur. Oh, we definitely did. I remember seeing it and thinking to myself it actually reminded me of an animator's work, but couldn't for my life recall who. I didn't realise we hadn't included it here! Let me go digging for it. It's possible it got lost in the shuffle.